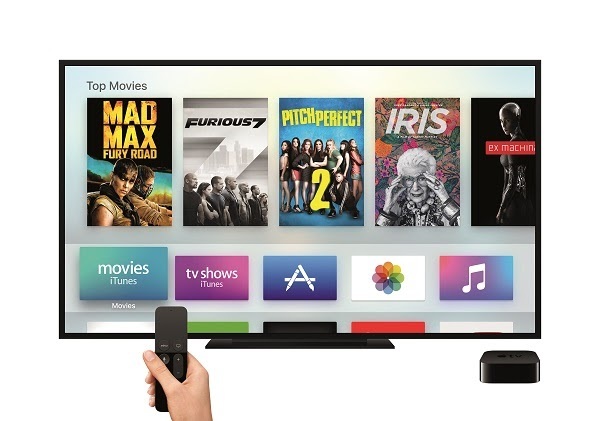 Apple introduces new Apple TV with tvOS. Apple today introduced the all-new Apple TV with tvOS, bringing a revolutionary experience to the living room based on apps built for the television. Apps on Apple TV let you choose what to watch and when you watch it. The new Apple TV's remote features Siri, so you can search with your voice for TV shows and movies across multiple content providers simultaneously. With Siri, you can use your voice to search TV shows and movies by title, genre, cast, crew, rating or popularity, making it easy to say things like "Show me New Girl," "Find the best funny movies from the ‘80s," "Find movies with Jason Bateman" and "Find popular TV shows for kids." Apple TV will search iTunes and popular apps from Netflix, Hulu, HBO and Showtime, displaying all the ways the resulting TV shows and movies can be played. Siri also offers playback control and on-screen navigation, as well as quick access to sports, stock and weather information. The new Apple TV will be available at the end of October starting at $149 (US) for a 32GB model and $199 (US) for a 64GB model from Apple.com, Apple's retail stores and select Apple Authorized Resellers. A new Xcode beta is available for developers today that includes the tvOS SDK at developer.apple.com/xcode/downloads. Developers can request an Apple TV developer kit at developer.apple.com/tvos/.